The 1914 “Tin Lizzy”, the “Flivver”, with gas headlights and a bulb horn, rattled along on its cord tires on a deeply rutted road. In the back seat of the Model T sat a six-year-old girl with her father. She clutched a pail full of huckleberries on her lap, which she had picked all by herself. Now they were heading home with the results of the picking foray. Her face had a satisfied expression, like a cat who had just dropped its dead prey on the doorstep. In the front seat, the two other occupants of the vehicle were recalling the interesting incidents at work in the railroad shops. This was the day off for all three yard workers. One of them had the spontaneous idea of going berry picking for a change of atmosphere. Perry brought his little daughter along at the insistence of his wife, and the other men were agreeable to having her along on this short ride. As they left the berry patch, the driver decided to take a shortcut along an old log road. Jerking along this uneven road, the occupants were thrown from side to side, but the jostling only increased the laughter and fun for the men. Suddenly, the left front wheel rolled into a deeper rut filled with water, and, without warning, it became jammed in the mire. The jalopy pitched, unseating the child who sailed toward the un-curtained side of the car. But the quick maneuvering of her father held her firmly and kept her from harm. In the process, though, her pail tipped over and all the berries she had so laboriously picked spilled out, some on the car floor and some in the road. Seeing her distress, her father consoled her by filling her pail with berries from his own container. The men worked the car out of the hole, continued on, and finally arrived at Perry’s house, where father and daughter alighted. Perry’s wife was pleased to see the berries, and she was especially happy to see that her husband did not tag along with his two buddies to the local bar! Proudly carrying her pail into the kitchen, the child remembered that these were not the berries she had picked, and she wanted to make this clear. So she immediately related the muddy mishap to her mother. 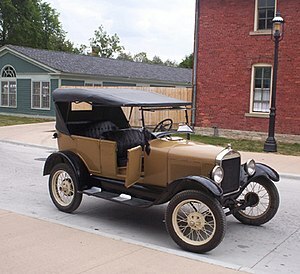 Now chugging along in the Model T, the two front seat riders drove on to the tavern up the dirt-packed road. Entering the tavern, they slapped each other on the back, roaring with laughter. It had been some time since they had pushed a car out of a rut, getting wet and muddy. Their friends at the bar joined in their merriment. After playing a few card games, and using the berries as collateral when the money was exhausted, they strolled out. Well inebriated, the two men got into the “Tin Lizzy”. Their clumsy movements took some time to get it started. Finally, it started, and with a jerk, the wheels screeched, kicking off the dried mud that had been picked up earlier. Laughing and talking as they spun out, they were oblivious to the farmer up ahead, with a herd of cows crossing the road. A sudden thump against one large black angus tipped the “Flivver” over and over into a nearby field. Fortunately, this had a sobering effect on the men, who crawled out with minor cuts and bruises. Unfortunately, however, this was the demise of the 1914 Model T “Tin Lizzy” with the gas lights and the bulb horn. The black angus didn’t fare much better! This entry was posted in Angie's Smorgasbord and tagged Angus, berry picking, cows, farmer, huckleberries, inebriated, jalopy, merriment, Model T, railroad, rut, tavern, Tin Lizzy.